Here’s a great little caper set inside London’s Tate Museum. 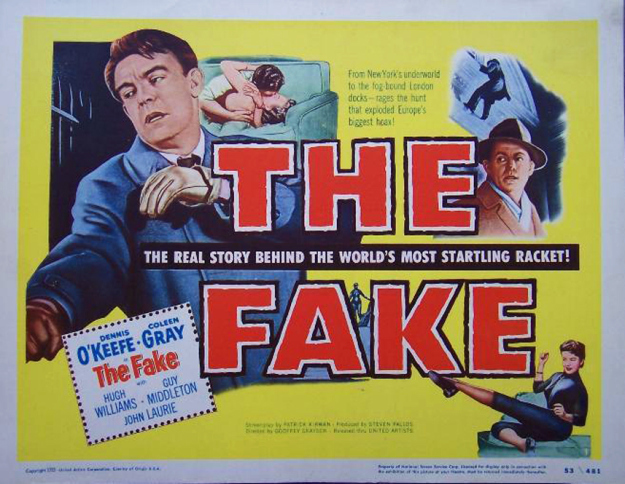 Starring versatile noir favorite Dennis O’Keefe, The Fake is a strong example of that overused word in film criticism: “romp.” Yeah, I know, I just used it, but it really is adequate in this situation. More, The Fake is a “condensed romp,” with minimal locations and characters. There’s still a bit of that hard-edged noir aesthetic, but overall it’s a fun, lighthearted crime film that’s the sort of perfect lazy Sunday afternoon fare people spend hours penetrating Netflix for. While no means a classic, The Fake has enough unique things going for it to make it a blast to watch. I mean, when’s the last time you saw a mystery where the color lapis lazuli was a major clue? American investigator Paul Mitchell (O’Keefe) is tasked with protecting Da Vinci’s “Mother and Child” painting during its exhibition at the Tate. Two recent art robberies leads him to believe Da Vinci’s is next on the hit list. The night it arrives, there’s a botched robbery of a piece. Mitchell and the local cops are able to retrieve Da Vinci’s masterpiece and it’s put on display in the museum. The Fake was actually shot in the Tate and director Godfrey Grayson and cinematographer Cedric Williams take advantage of the building’s long halls and high ceilings, draping them in shadow and menace. Like I was hoping, there is a foot chase through the museum later on and it’s pretty damn impressive. Mitchell soon begins to suspect that the “Mother and Child” on display isn’t bonafide. In his investigation he’s aided by Guy Middleton, who plays a British cop who always seems to pop up at the right time. One of his prime suspects in the art heists is a man named Mason. Mitchell befriends his daughter, played by the too cute for words Coleen Gray. More than a pretty face, Coleen doesn’t take any flak from anyone, especially Mitchell when he accuses her father of robbery. There’s a rocky chemistry between them on screen. Their scenes together are really fun to watch. What seems like a simple mystery actually turns nicely convoluted, as Mitchell uncovers a web of lies and, uh, rare paint. Yes, lapis lazuli is a key element to the caper. See, lapis lazuli was only introduced as an oil paint is such-and-such a year, so for it to be used in a Renaissance painting is impossible. But even today (1953) it’s a rare color to come by, so Mitchell has to track down locals who may be selling it. Tracing the source of a unique oil paint color may not be as exciting as chasing a smuggler through the sewer tunnels of Vienna, but it’s still fun stuff nonetheless. As far as I can tell, The Fake was never released on DVD, so it’s pretty cool Netflix streams rarities like this. It’s a “condensed romp” (c’mon, that’s a pretty cool term I coined right there) that doesn’t require any emotional investment from the audience. Driven by some top notch performances (does O’Keefe ever do wrong), The Fake is definitely one to check out if you’re lost in a Netflix black hole. What a shame. You were doing so well until the last-sentence grammar killer, “your lost”. Fixed! Thanks so much for your valuable, thought-provoking insight.